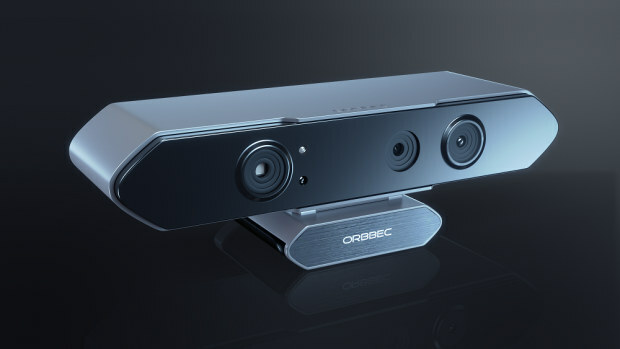 Orbbec is a startup working on 3D cameras which can be used for gesture recognition, 3D scanning, research purpose, and more. The company has now embedded their Astra 3D sensor into an ARM based mini PC running Android and/or Ubuntu which they call Orbbec Persee. There’s no mention of the operating systems’ versions, but since the products is highly likely based on Rochchip RK3288, Android 4.4, and Ubuntu 15.04 / 15.10 should be running on the device once it ships to backers. Astra 3D cameras are supported using Orbbec Astra SDK with C/C++ API, and samples, with the latest version (v0.3.0) currently available for Windows 7 and later, and support for Mac OS X 10.8 or greater, Ubuntu 14.04 or greater, and Android 4.4.2 is coming soon. Persee will also run OpenNI 2 to handle gesture recognition and motion sensing. The SDK is said to support “Processing, and openFrameworks, Cinder, and Unity 3D will be coming soon”, and developers can get technical support on the forums. Wondering how well it may work? Check out the gaming demo. More demos showing how to control a user interface with gesture, and what the real-time depth image looks like can be found on Orbbec 3D YouTube Channel. Beside Astra Pro 720p camera, the company also offers Astra S VGA camera, and both can be connected via USB 2.0 to a computer. Orbbec Persee was launched on Indiegogo a couple of days ago, and the project already raised around $45,000 out of their $40,000 funding target. Rewards start at $99 with Astra camera (VGA or 720p), but you’ll need to pledge at least $179 to get Orbbec Persee mini PC. Shipping starts at $12 to North America, but jumps to $50 to the rest of the word, with delivery scheduled for February 2016. Further details may also be found on Orbbec 3D website. Camera seems similar to Xbox Kinect – any comparison available? So Astra Pro has a higher depth (16-bit VGA), and can apparently sustain 30 fps. I don’t see that much difference between Astra and Carmine.